Details about WORLD SPORTS MAGAZINE. DECEMBER 1967. WORLD SPORTS MAGAZINE. DECEMBER 1967. Cookery, food & drink etc. WE DO NOT ACCEPT PAYMENT IN CASH OR CHEQUES IN ANYTHING OTHER THAN GB POUNDS, UK STERLING. PLEASE DO NOT SEND DOLLARS AS THEY WILL ONLY BE RETURNED. PLEASE NOTE OUR POSTAGE COSTS BEFORE BIDDING. THE COSTS INCLUDE POST AND PACKING!!! AS WE EMPLOY A PACKER. IF YOU ARE UNHAPPY WITH THE COSTS PLEASE DO NOT BID. IF YOU ARE BIDDING FROM OVERSEAS AND WISH TO KNOW THE COSTS FOR SURFACE RATHER THAN AIR PLEASE EMAIL. 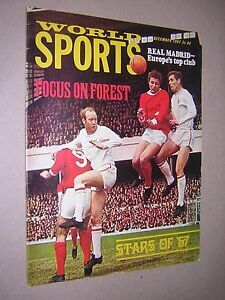 WORLD SPORTS MAGAZINE. DECEMBER 1967. WORLD SPORTS MAGAZINE. DECEMBER 1967.